A rainscreen façade is a non-structural, decorative outer skin of a building that protects the internal structure from wind and rain. Rainscreen cladding panels are made from a wide range of materials, including aluminium, steel, zinc and copper, along with glass and ceramic. It is the rear ventilated cavity between the outer rainscreen facade and internal structure that facilitates constant circulation of air. This air enters at the base of the façade, travels up behind the outer cladding panel and is expelled at the top, taking any moisture that penetrates the joints between the outer façade panels with it and preventing it reaching the internal structure. Although this rainscreen façade provides the building with performance benefits – specifically keeping the internal structure dry – the outer skin does not contribute directly to the buildings thermal performance. That is one of the reasons why a growing number of specifiers are choosing to combine the benefits of a rainscreen façades (aesthetic appeal and rear ventilated cavity) with the advantages of composite panels. This includes excellent thermal performance as well as being lightweight and strong. When viewed from the outside of the building a composite panel and a rainscreen cladding panel can be indistinguishable. However, a composite panel incorporates insulation that is sandwiched between two metal skins or cassette, creating a lightweight, energy efficient wall system. Composite panels usually span between cold formed purlins or side rails, which in turn span between the primary frame members. 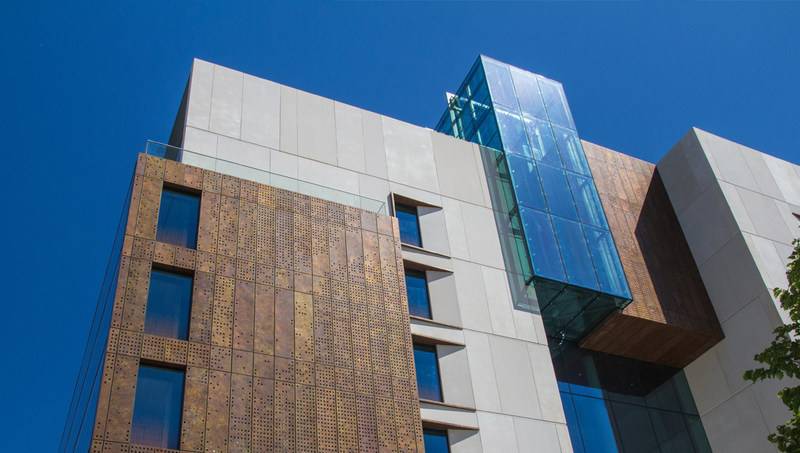 Composite panels offer less choice in terms of aesthetics though, and that is one of the reasons why they are being utilised as a support system to our rainscreen façade panels (available in an extensive range of materials and finishes). We have, for a number of years, partnered with a range of composite panel suppliers, including Paroc, Kingspan and Eurobond, where our façade cladding panels are fixed to the composite panels, removing the requirement for cement board, insulation and SFS subframe system. As you would expect this speeds up installation on site and results in savings on materials, in some applications. It is the strength of the steel cassette that forms the composite panel, which allows the rainscreen system to be supported from the face of the composite panels. These composite panel systems allow a simple secondary top hat / sub frame to be installed prior to the connection of the rainscreen system which needs to be installed in line with the composite manufacturer’s instructions and calculated weight loadings. We have supplied our rainscreen façade panels fixed to composite panels, fully compliant with current building and fire regulations and achieving Part L2 airtightness, on a number of projects. This includes Imperial West, Molecular Sciences Research Hub at Imperial College in London that was designed by Aukett Swanke. Alongside this we supplied Fort Kinnaird, a large outdoor retail park located south-east of Edinburgh, which involved pre-fixing our TECU Brass Patination (Artisan) cladding panels to an insulated composite panel. When specifying rainscreen façade panels fixed to a composite or sandwich panels there are a few simple steps you need to follow. Firstly, it’s worth pointing out that it is possible to mount the rainscreen facade panel in the same direction of the span as the composite panels, although it is also possible to align them in the opposite direction. That means you still retain complete flexibility of façade design. Although both composite panels and façade cladding panels are strong and rigid, making them able to withstand the loads caused by positive and negative wind pressure on the surfaces, means that secondary rails may be required. These ensure a Uniformly Distributed Load (UDL) on the face of the panel, measured in kN/m². Particular care should be taken where there is raised wind loading or extra-large spans are specified. Calculation of UDL should be done on a project specific basis by the relevant composite panel manufacturer and their standard installation guidelines. Other factors to take into account are ensuring that there are no fixings within 100mm of the edges of the façade and composite panel. There should be continuous fixings along the length of any secondary supports, spaced at 300 – 500mm centres. The distance between the inner composite panel and outer rainscreen façade is typically up to 300mm, although this is subject to project specific review and loading of the panel system being installed. Combining the benefits of exterior rainscreen façade panels with composite panels is an excellent way to achieve a low carbon build whilst maximising internal square meterage – one of the best ways of optimising rental or investment income. That makes it an ideal solution for retail, office and other commercial buildings. 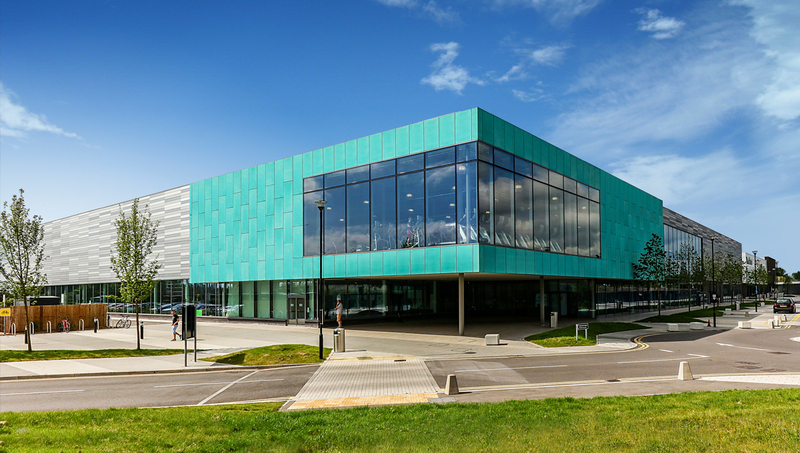 Proteus is able to supply everything needed to complete these efficient structures including the rainscreen façade panels, soffits, reveals, canopies and copings. We can also help you develop a suitable installation solution working with one of the composite manufacturers such as Paroc, Kingspan and Eurobond. To view recent case studies where our façade cladding panels have been fixed to insulated composite panels, click here.